One of the great things about Chrome is that you can customize it in many ways like changing its theme and New Tab page. That’s not all. You can also set it up to open multiple startup pages . By default, Chrome only has one startup page and it’s usually the New Tab page. However, you’re free to change the startup page in any way that you want. You can also opt to transform your Chrome Start Page into a personal dashboard. 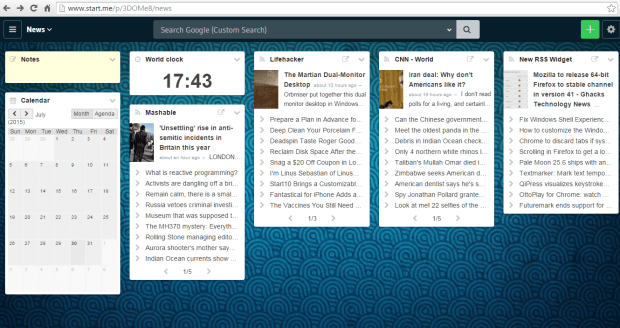 So every time you open Chrome, you can instantly get updates from your selected categories and widgets. First, go to  the homepage of “start.me” and then create your free account. After creating your account, log in and do not forget to install  the start.me extension for Chrome. After installing the Chrome extension, it will automatically update and modify your browser’s Start Page. So instead of the usual New Tab page, your Start Page will now be directed to your start.me page. For first time users, it is important that you do not skip the welcome tour so that you’ll know how to set up your Start Page and place the widgets that you like. You may even customize your Start Page’s background. If you want to add bookmarks, just click the green plus icon at the top control bar and then specify the sites that you wish to bookmark. That’s not all. The said web app also lets you set multiple Start Pages with up to five columns per page. As for widgets, start.me offers a wide range of widgets for bookmarks, RSS, calendar, Gmail, weather, world clock, sports schedules, etc. So once you’re done setting up your new Chrome Start Page, you are now ready to test it out. Close your Chrome browser first and then re-launch it. You’ll immediately see your new Start Page that displays almost everything you need (ex. news, emails, weather, etc.) in just one place. If you want to restore your default Start Page, just disable the start.me extension from your Chrome browser.